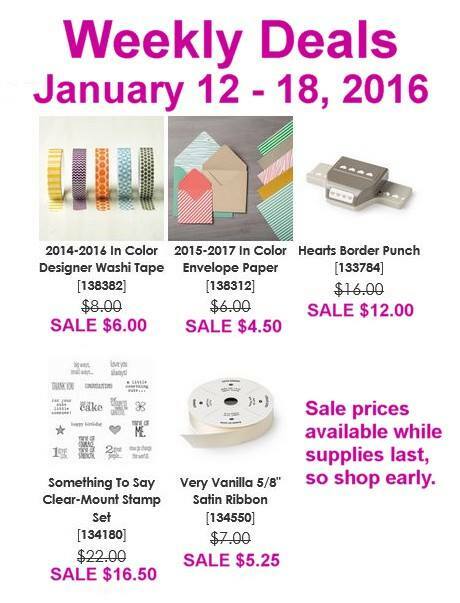 Brand new Occasions Catalogs and Sale-a-Bration is just the way to kick off the New Year! Don’t you think? I am so excited about all the new offerings we have for you and what better way to showcase tons of stuff but to have a Sale-a-Bration Blog Hop! The Sale-a-Bration Set I’m featuring today is Honeycomb Happiness. Such a sweet set, don’t you agree? So what I wanted to capture here was a special card with heavy rich texture…so I used all Watercolor Paper as I love how it feels and looks. 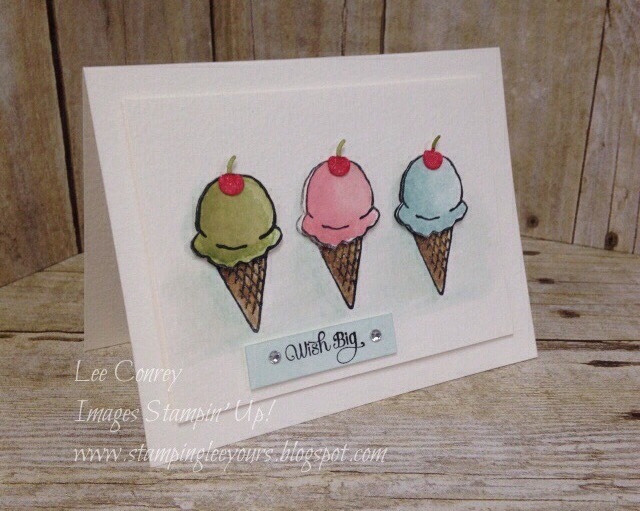 The colors I used for the ice cream are Soft Sky, Blushing Bride and Pear Pizzazz Re-inkers. Oh, I also used Crumb Cake and Soft Suede for the cones. So color in your cones with an Aqua Painter using the Crumb Cake first and then hi-lite with the Soft Suede. I also used the new “Wink of Stella” in gold to highlight the crosshatch marks on the cone. I’m in love with this product. It’s a must have!! Do a bit of a color wash with the Soft Sky “ on the mat for a soft effect. The little banner on the bottom is using watercolor paper as well. The Sentiment “Wish Big” is from “A Dozen Thoughts” and stamped in Black Stazon. I did a color wash over it once it dried using the Soft Sky re-inker and my Aqua Painter. Attached it with dimensionals and added a Rhinestone on either side. I hope you like my little creation…..it’s came out just the way I envisioned. Love when that happens. So, are you ready to grab up some of these fabulous Sale-a-Bration Sets? I know you are…..all you have to do is place a $50 order and this set can be yours for FREE! That simple. Please feel free to browse the New Catalogs online at my website and get yours today. Here are the Weekly Deals that are going on right now.....how fun to add sale items to your order, right? Now are you ready to see more Sale-a-Bration Creations? I know I am. If you came here from Patty’s that’s great. If not please go back to see what she has done. That’s it for today….hope you enjoy the Hop!